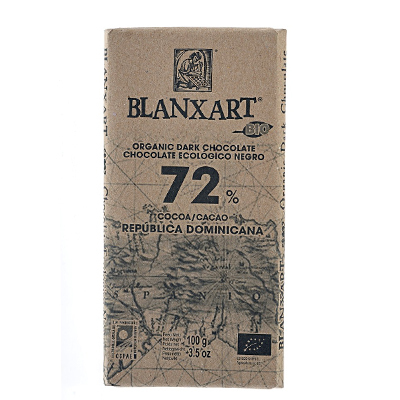 An artisan dark chocolate bar made from Dominican beans and created by maker Blanxart. Making chocolate since 1954, today Spanish maker Blanxart remains faithful to its origins; all of its packaging and boxes contains the same logo and its production is overseen by fourth generation master chocolatier Xavier Cordomi. This Dominican Republic bar is quite remarkable. It’s as it melts on your tongue, you’re met with wave after wave of chocolatey pleasure. This super dense bar has an almost molten quality. Tasting a piece of this incredibly rich, creamy bar is just like eating the centre of a chocolate fondant. Truly impossible to resist. Want to find your perfect chocolate match? Visit www.cocoarunners.com/tastetest today. This chocolate is my absolute favorite, I have tried a lots of brands and eat fine chocolate on a daily basis, still this is the number ona on my list. This bar used to have a contemporary bar with Almonds, which also was one of my favorite, but Blanxart have changed the beans and the recipe for the latter recently and it's no longer upp to the old standard. I honestly hope they are not goint to alter the recipe or the beans for this particular bar because it is perfect as it is with its rich, creamy, aromatic chocolate flavor. It's also very suitable to have it to a cup of espresso for instance. Enchanting and amazing bar. The moment it melts it takes on a brownie-like consistency and texture. Highly recommended. Thick, very creamy, like someone said double-choc, classical true dark chocolate bar, quite dry cocoa-y aftertaste. if it would be coffee, it would be Brazil Santos. Bonus points for no foil. Lets keep that packaging straightforward. Less is more. Very rich dark brown colour for a 72%. Delicate on the nose. Melts on the tongue. Bittersweet taste, some nutty notes, a hint of truffle. Very mellow. Not an original taste, but this one delivers the classical dark chocolate in a great way. One of the best chocolate bars I’ve tried, it’s compares to the taste of double chocolate and is very smooth. Any dark chocolate lover must try! Takes a minute for the true flavour of this chocolate to develop but once it does its fudgy and decadent. Absolutely loved this bar. It struck a perfect balance of a deep rich taste and smooth, creamy texture. It reminded me of eating dark chocolate pudding. My favorite bar from the first box and one that I would definitely buy again. Definitely my favourite from my first box. Creamy, rich and indulgent with no bitter undertones. Will purchase this again. It's very rich and lingers a long while after tasting. This one has a quite one-note flavour and is perhaps not the connoisseur's chocolate, but it has depth and is utterly enjoyable. I cannot award it less than five stars. I'm a new to the world of dark chocolate and this was my favourite from the first box. Dark chocolate is defiantly an acquired taste and this is a good one to start with. This was my favourite bar from my first box. Smooth, creamy and rich. One of my favorites! It's very rich and finish taste is a little astringent, love it! Really nice for a 72% cocoa bar. Tastes like a rich chocolate flavoured ice cream. One of my favourite bars after 3 months membership, rich and green and lovely long lasting taste. Incredibly smooth with a sumptuous and pronounced cocoa flavour. Luscious breakdown, very well integrated sweetness and long lingering flavour. Subtle tannins on finish. Exemplary organic chocolate. Sits nicely in the sweet spot between milk- and dark chocolate, with only a hint of bitter and without unpleasant aftertaste. Very nice to have a piece after a meal.